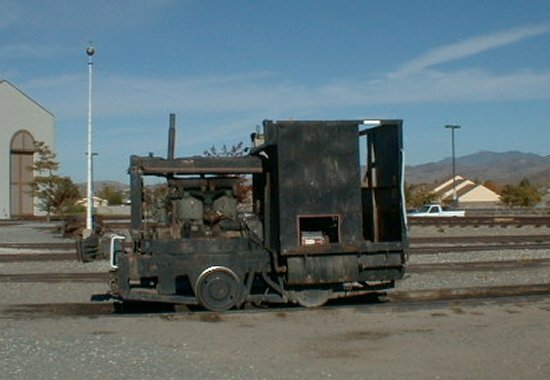 The little gas-mechanical switch engine, named the "DINKY" here at the Railroad Museum, is typical of numerous small locomotives used by many types of industries to move railroad cars around their facilities. Not much is known about the past owners of this particular engine, or the types of service it was used in. We believe it was built about 1924 by the Davenport Locomotive works of Davenport, Iowa. Davenport was a major manufacturer of small industrial steam, gas and diesel powered switch engines. Over the years the "DINKY" has been modified many times, and today bears little resemblance to the way it looked when it emerged from the Davenport factory. As the former restoration contractor at the Railroad Museum, Short Line Enterprises returned the "DINKY" to operating condition in the early 1980's for use here. The Museum acquired the "DINKY" in 1988 as part of a purchase of historical railroad equipment from Short Line Enterprises. It is still used to move cars and locomotives around the Museum's shop and storage trackage as needed, typical of the work it was designed to do way back in 1922.